Chanting slogans such as ‘Resist Suppression of Media’ and ‘Uphold Rule of Law’, hundreds of journalists held a demonstration on Tuesday to mark ‘Black January’ – a month that has recorded an unusually high number of attacks on media personnel. Gathering at Lipton’s Circus in Colombo, journalists joined by media activists and opposition politicians, decried the lack of media freedom in the country and the Government’s lack of commitment to uphold free speech. Organised by the Alliance of Media Organisation, an umbrella group consisting of several journalist groups, the demonstration saw journalists demanding answers to the disappearance and mystery killings of journalists. They questioned the Government’s silence on the crimes against journalists. They held placards and banners, condemning the Government for its failure to bring to justice the culprits behind the attacks on journalists. A public rally followed the protest. Dharmasiri Lankapeli, General Secretary of the Federation of Media Employees Trade Union, said Black January was marked to highlight threats to journalists and media rights activists, many of whom have left the country for fear of being attacked or killed. Lakshman Gunasekera, South Asian Free Media Association President for Sri Lanka, said remembering Black January was important because the worst period for journalists was not yet over. “Journalists have gone into exile or voluntarily migrated to other countries in the past five to six years due to death threats, physical assault and harassment by security forces or other unknown groups linked to the regime. There have been instances where some well-known journalists have left their job due to threats,” he said. 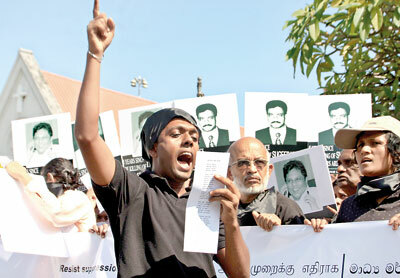 A. Nixon, Secretary of Sri Lanka Tamil Media Alliance, said journalists take to protests and practise critical journalism in keeping with the principles of the profession and their intention was not to topple the Government. Opposition politicians Sarath Fonseka, Tissa Attanayake, Karu Jayasuriya, Eran Wickremaratne, Vijitha Herath, Siritunga Jayasuriya and several trade union activists participated in the protest and the public meeting.